Sir Ganga Ram Trust Society , Board of Management , Consultants and Staff of Sir Ganga Ram Hospital(SGRH) today celebrated its 64th Founder’s Day. On this occasion Shri Anil Baijal , Hon’ble Lieutenant Governor , NCT of Delhi was the Chief Guest . The celebrations started today morning by garlanding the statue of Sir Ganga Ram Later in the day , Shri Anil Baijal distributed Meritorious and Long Service awards to staff and doctors of the hospital . A cultural programme was presented by students of School of Nursing. 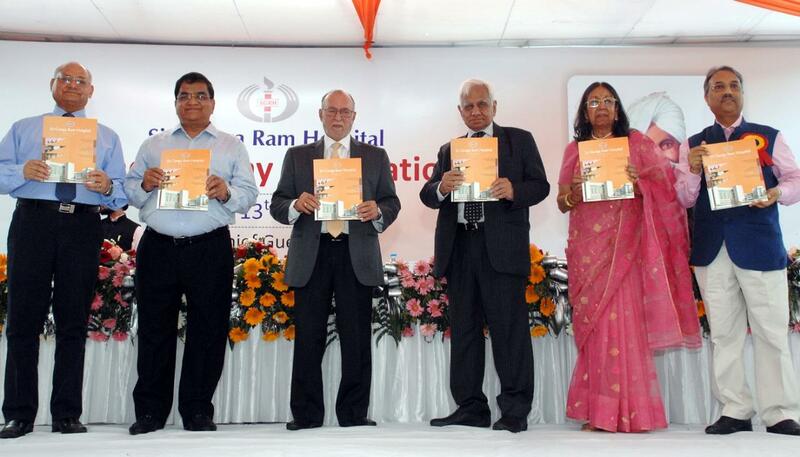 On this occasion Dr D.S.Rana , Chairman , Board of Management , Sir Ganga Ram Hospital read the Hospital Report and Shri Ashok Chandra , Chairman , Sir Ganga Ram Trust Society welcomed the guests . Mrs Sujata Sharma , Honorary Secretary , Sir Ganga Ram Trust Society paid tributes to Sir Ganga Ram (1851-1927) Speaking on the occasion , Shri Ashok Chandra , Chairman , Sir Ganga Ram Trust society said , “ “ I am proud to say that our hospital apart from producing talented faculty for its own use , is also a nursery for providing talented doctors for delivering health care services across the country .”Speaking on the occasion Shri Anil Baijal said , “ With changing times, there is a paradigm shift in doctor and patient relationship. Trust between the two has gone down and needs to restored . Today patients are well informed and impatient. Empathy from medical professionals by saying a kind word or pat on shoulder will go a long way in restoring the trust . ”Shri Baijal speaking on increasing stress levels on doctors , said , “Today’s doctors , I find are full of stress due to patient centric pressures . Even on weekends when professionals from other fields are relaxing, doctors are busy in conferences. Doctors should de-stress themselves to charge themselves.”On a concern raised by Dr D S Rana , Chairman (Board of Management ) SGRH, about closing down of 63 years old Nursing School due to lack of space , Shri Baijal assured all help possible in allotment of land. Shri Baijal said , “There is need for brown field projects to overcome lack of space in Delhi.”Reading the Annual Hospital Report , Dr D.S.Rana , Chairman , Board of Management , SGRH said , “ During the last financial year , 57,000 patients availed our emergency services . In addition to this , the hospital admitted 97,608 patients in the hospital , out of which 7,460 were from economically weaker sections of the society who were treated free of cost . About 31,648 surgeries were conducted during the year . The hospital spent about Rs 75.84 crores on various charitable activities during the last financial year which is nearly 10 % more than the previous year Elaborating about the unique working of SGRH , Dr Rana said , “We are very particular in selecting talented consultants at junior level . We also provide lively and vibrant environment for the growth of young consultants and these consultants attain eminence in their respective fields by the time they occupy senior positions. However at the same time we continue lateral entry of eminent consultants from India and abroad.”Speaking further Dr Rana said , “ Unique doctor friendly and family atmosphere by the Board of Management consisting of eminent consultants provides the atmosphere of stability . For good doctors at tertiary care hospital , apart from state of art infrastructure for delivery of health care , academics and research are also very important components . SGRH is well known in non-government sector for having excellence both in academics as well as research . I am proud to say that our hospital apart from producing talented faculty for its own use , is also a nursery for providing talented doctors for delivering health care services across the country .”Sir Ganga Ram was an engineer by profession who was born on 13th April 1851 at a village Mangtanwala of Punjab Province in British India, in present-day Pakistan. He graduated from Thompson College of Civil Engineering in 1873. In 1921 , he established Sir Ganga Ram Hospital in Lahore which still functions by the same name and is a 500 bedded hospital attached to Fatima Jinnah Medical College . He expired on 10th of July 1927 in London . Sir Ganga Ram Hospital in Delhi was inaugurated in 1954 by then Prime Minister of India , Pandit Jawahar Lal Nehru and is today 800 bedded multi-speciality, tertiary care hospital .